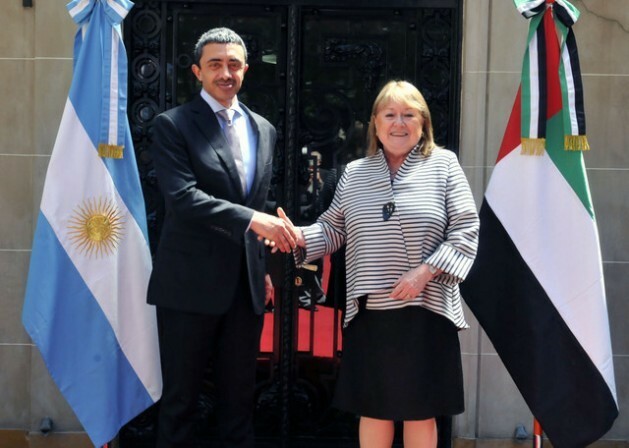 BUENOS AIRES , Feb 5 2016 (IPS) - With United Arab Emirates’ foreign minister Sheikh Abdullah bin Zayed Al Nahyan’s visit to Argentina, the two countries launched a new stage in bilateral relations, kicked off by high-level meetings and a package of accords. On Friday, Feb. 5 Al Nahyan and his host, Argentina’s foreign minister Susana Malcorra, signed five agreements on taxation, trade and cooperation in the energy industry, after a meeting with other officials, including this country’s finance minister, Alfonso Prat-Gay. The meeting in the San Martín Palace, the foreign ministry building, addressed “important” aspects of ties with the Gulf nation made up of seven emirates, an Argentine communiqué stated. Al Nahyan’s visit took the UAE’s contacts to the highest diplomatic level with the new Argentine government of Mauricio Macri, who received the minister Friday in Olivos, his official residence, less than two months after being sworn in as president on Dec. 10. After the meeting in the foreign ministry, the Emirati minister also met with Argentine Vice President Gabriela Michetti, and visited the Senate. The day before, Al Nahyan was named guest of honour in Buenos Aires by the city’s mayor, Horacio Rodríguez Larreta, with whom he met after the ceremony. The governor of the southern Argentine province of Neuquén, Omar Gutiérrez, was also present at the meeting, where an agreement was reached to grant a loan to that region to finance the Nahueve hydroelectric project through the Abu Dhabi Fund for Development (ADFD), in the town of Villa del Nahueve. A four-MW hydroelectric plant will be built in that town of 25,000 people in southern Argentina with an investment of 18 million dollars, through a soft loan, the secretary-general of the Argentine-Arab Chamber of Commerce, Walid al Kaddour, told IPS. According to the Chamber, trade between the two countries stood at 228 million dollars in 2014, with Argentina exporting nearly 198 million dollars in mainly foodstuffs and steel pipe and tube products. The population of the UAE is just barely over nine million, “but it can reach a market of 1.6 billion inhabitants, and it has major logistics infrastructure enabling it to re-export products,” he said. Al Kaddour said the UAE’s chief interest is importing food, “which is what Argentina mainly produces,” although he said the Gulf nation could also buy raw materials as well as manufactured goods. The UAE at one point imported up to 1,000 vehicles a year from Argentina, he pointed out. 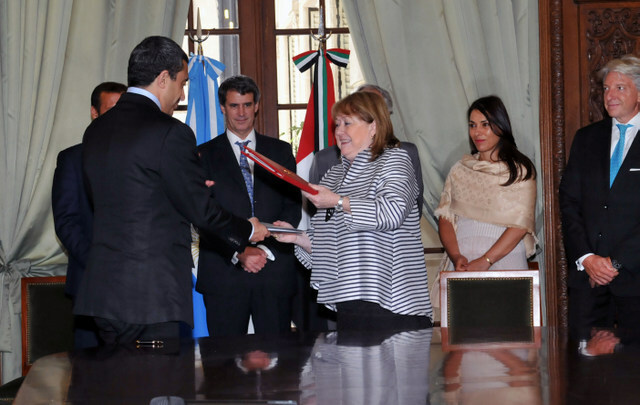 Macri, of the centre-right “Cambiemos” alliance, succeeded Cristina Fernández of the centre-left Front for Victory, who had strengthened ties with the UAE during an official visit to Abu Dhabi in 2013, where an agreement on cooperation in nuclear energy for peaceful purposes was signed. “The UAE has pinned strong hopes on the new administration in Argentina,” said Al Kaddour. “The last few years have also been positive in terms of building a friendlier relationship. “The idea now is to move towards concrete things, such as investment projects in different areas, like renewable energy and agriculture,” he added. Emirati sources told IPS that the UAE minister and the Buenos Aires mayor discussed questions such as sustainable urban development and solar energy – an area in which the Gulf nation is interested in cooperating with Argentina. Although it is a leading oil producer, the UAE is considered a pioneer in the development of unconventional renewable energies, which it is fomenting as the foundation of clean development that will curb climate change. In Argentina, Al Nahyan kicked off his Latin America tour that will take him to Colombia, Panama and Costa Rica through Feb. 12.